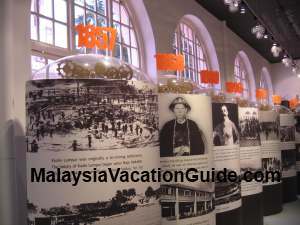 KL City Gallery is the latest attraction in the old city of Kuala Lumpur where her history first started. This gallery is housed in a Moorish architecture building over a century old. This building was built in 1899 and the architect was A.C. Norman. It was used as a printing and press office by the British during the colonial time. Official government documents, books and train tickets were printed here. After independence, the Ministry of Labor took ownership of the premises and later on it became a Postal Security Office. 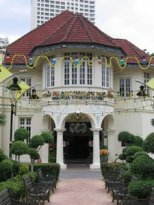 Kuala Lumpur City Hall took over the building in 1986 and converted it to become a public library known as the Kuala Lumpur Memorial Library. The entrance to the gallery. Side view of the building. A brief history of the city with important years were re-enacted here. Plan to spend 45 minutes here. 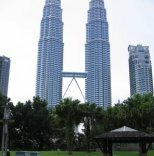 The entrance itself is attractive with a big structure "I Love KL" by the side of it. Visitors will usually take photos with this structure. Admission fee is RM10 and there are counters to help you with any travel bookings or enquiry regarding the city that you may have. Take some brochures to help you move around the city. 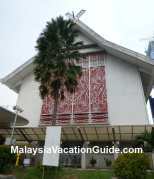 One of the brochures that you must take is the Kuala Lumpur Walks & Tours Map. 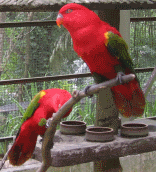 This map provides a comprehensive write-up on the places of interest in Kuala Lumpur. Take some time to read and see the information on the heritage and culture here before exploring the city. Photos and a brief description of the historical buildings around the city are included in this informative map. 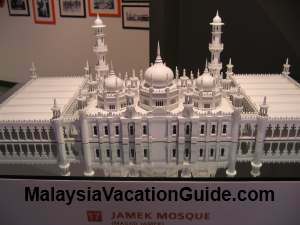 A miniature model of Masjid Jamek. This historical mosque is 5 minutes away from the gallery. A model of Dataran Merdeka and the surrounding buildings at KL City Gallery. You can browse and purchase some souvenir here if you like to. 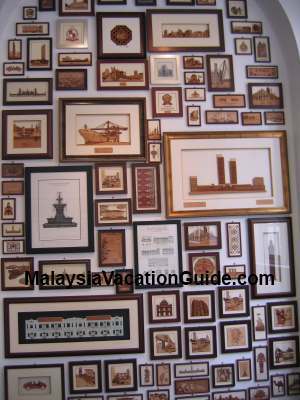 As you move into the exhibits area, you will encounter the section known as Memories of Kuala Lumpur that highlights the history of this city through photos, write-up and miniatures. Take note of the nicely constructed Kuala Lumpur City Gallery and Masjid Jamek miniature models. You will learn how this city was discovered and the contributions of Yap Ah Loy, the third Chinese Chief of this city. The next section has a diorama model of Merdeka Square and the surrounding areas. 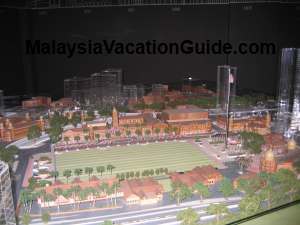 Sultan Abdul Samad Building, the 100m flag pole, Royal Selangor Club, Kuala Lumpur Library, Warisan Building and Malaysia Textile Museum are included in the model. Make sure you take some time and visit these historical buildings. The Making of Arch shows how The Arch souvenirs are being made here. Miniatures of models and gifts are made from veneer wood. The final section is where you can purchase some souvenir made by The Arch brand. Models of Petronas Twin Towers, KL Tower and other sky scrapers unique to Kuala Lumpur can be seen here. Monday to Sunday: 9:00am to 6:30pm. Take the LRT trains and alight at Masjid Jamek station. Take a walk towards Jalan Raja and you will arrive in 5-10 minutes time. Look out for the 100 m flag pole which will be visible from afar.